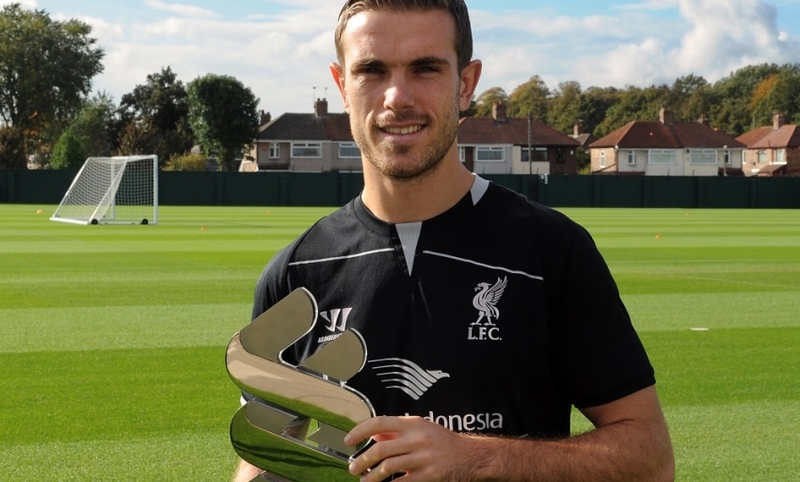 Jordan Henderson has collected the Standard Chartered Player of the Month award for September at Melwood after the Liverpool vice-captain was selected as the stand-out performer by Reds fans. The 24-year-old started four of the team's five fixtures throughout an admittedly testing month, including his first opportunity to experience Champions League football, in a 2-1 home victory over Ludogorets Razgrad. On the eve of the tie with the Bulgarian title-holders, it was confirmed that the No.14 had been chosen as the club's new vice-captain - recognition of the remarkable progress he had achieved during the preceding two years. The immense levels of endeavour, spirit and application that earned Henderson the honour from Brendan Rodgers were in abundance during September, prompting supporters to nominate the midfielder ahead of Steven Gerrard and Adam Lallana in our dual poll online and via Twitter. 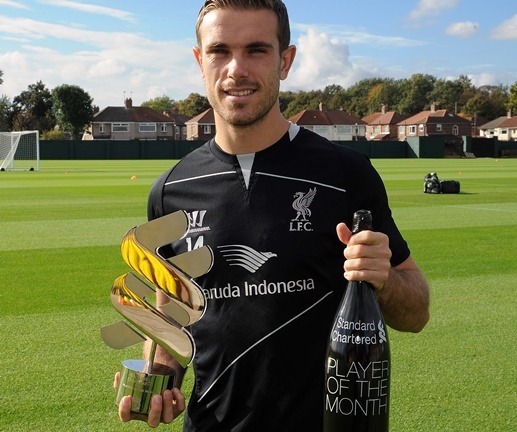 Upon receiving the accolade, he said: "It's obviously nice to get the Player of the Month award. I'd like to thank all of the fans that voted and hopefully I can get a few more in the coming months. "I much prefer the team ones but it is always nice to get individual ones as well. I can still get better. I can get in the box more and get more goals. I've still got a lot of things to work on in training, improving my all-round game. Hopefully I can continue to do that." Henderson has just returned from international duty with England and now switches focus to the resumption of Barclays Premier League and Champions League action. The Reds are tasked with a trip to Loftus Road to face Queens Park Rangers on Sunday afternoon, with the midfielder confident of building on the platform provided by a win over West Bromwich Albion at the beginning of the month. "We can still improve; we've done well in certain games and not so well in others so it has been mixed for us," he added. "But hopefully now we can really kick on our season, build up a good run, build up confidence and put some good performances in. We've got a lot of talent in the group and we're confident at the minute, so hopefully we can do that." Click play on the free embedded video below to watch Henderson accept his prize.